If you hear the word, “teahouse,” in Hawaii, you may assume the reference is more Japanese than English. But, that’s not the case at A Cup of Tea in Kailua, an authentic teahouse which transports locals and visitors back to Hawaii at the peak of the Victorian Era. A Cup of Tea is as authentic an English Teahouse as you would find in England itself, and the decor is the first hint that you are in for a unique experience. 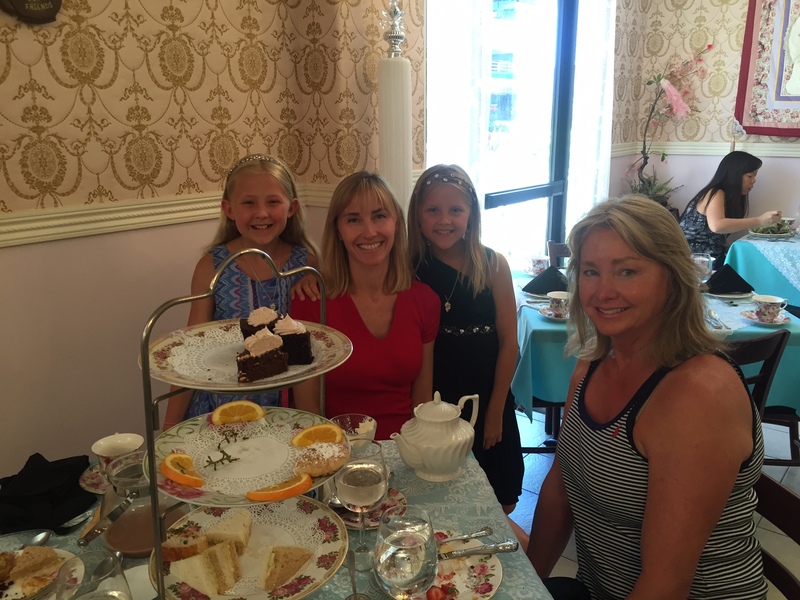 The day I took my two daughters and mother, the parlor was decked-out in Summer pink and white (owner Darlene Pahed changes the decor five times a year), and the tables were adorned in fine china. Covered with lace and linen, the tables were quaint and pleasing, and even the servers donned aprons and bonnets. We felt like we were transported back in time to an English tearoom. First, a server asked us to choose our tea from a smelling chest of more than twenty different types of teas. As a hostess led us to our table, our steeped pot of tea followed right behind. We opted for “Princess Heather’s Tea” which included: Soup of the day, salad, assorted tea sandwiches, scone of the day with preserves and lemon curd, seasonal fresh fruit, dessert, and a pot of tea. Our food arrived on a three-tiered tower, and to say it was plentiful is an understatement. Unlike many tea services, after which diners leave hungry, the amount of food was substantial, and we couldn’t even eat our included ice-cream (which is rare for our crew). If “Princess Heather’s Tea” isn’t the right tea service for you, the teahouse includes several other options. They include “Lady Tiffany’s Tea,” “Nikki’s Afternoon Tea,” or “The Wee Tea, ” which is for guests ten and under. Each tea service includes a variation of sandwiches, tea, scones, soup and salad. You can also choose “Lunch to Go Take Out,” which includes the sandwich of the day, a bag of chips, and a large iced-tea or lemonade. You can also order a dozen scones to go for $14.95. Pahed says the tearoom is home to a host of theme-nights as well. The parlor is open for pajama nights, Bingo nights, and even Audrey Hepburn night. For Audrey Hepburn night, Pahed says the teahouse partners with Nordstrom, and ladies are decked-out in Victorian clothes and hats for the event. 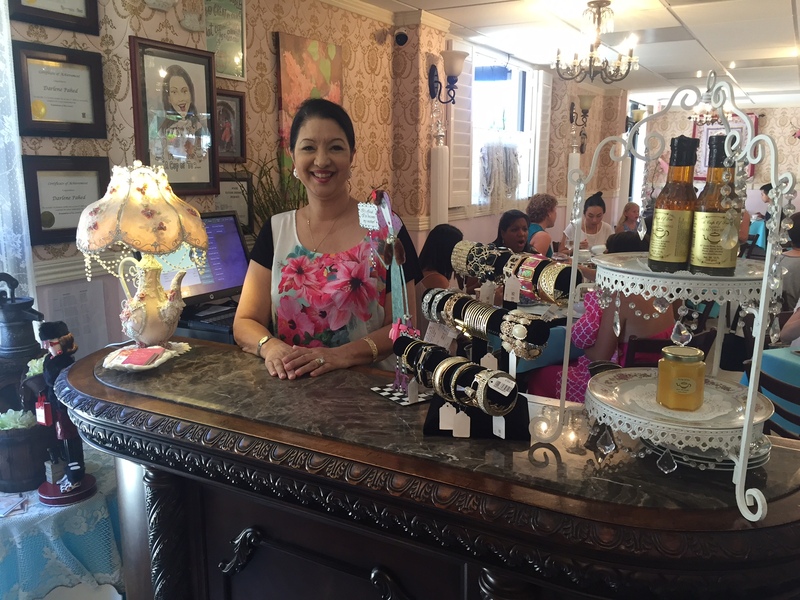 Owner Darlene Pahed is proud of her authentic tearoom. For visitors to Hawaii, the teahouse is worth the trip to the windward side, especially if you are looking for a unique island experience. Pahed says she sees many global visitors year after year, all of them back for another day of pampering and relaxation. Pahed says the teahouse is set to expand into the ice cream business. She annouced that, in August, she will open an ice cream parlor to compliment the tea service-side of the business. For visitors from any country, finding an authentic English tea service isn’t easy in a destination known for its Asian influence. However, A Cup of Tea may be worth a visit if you want a taste of history.